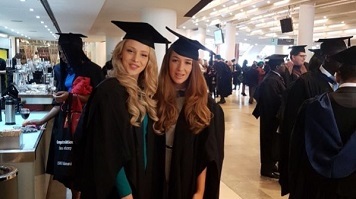 Daisy took some time out from education during her A levels and degree here at LSBU, but she’s glad that she took this time to really reflect on what she wanted, and how she was going to get there. Daisy did very well at GCSE’s but lost the va va voom during A levels and couldn’t really see the relevance of them towards her career goals. After being introduced to the AAT’s Daisy was confident she knew exactly what she wanted to do. “LSBU was a ‘just know’ moment for me, and LSBU stood out to me massively when making the decision about where I wanted to pursue my degree! As I had already decided I wanted to become a Chartered Accountant; the opportunity to study for my degree, gain 9 exemptions from the ACCA, save money whilst living at home, and study in one of the most ethnically, and culturally diverse parts of London… well I guess sometimes, you ‘just know’ “. Daisy will continue to study towards her ACCA qualification, as she’s lucky enough to receive study support with her new role, where she’s recently secured her dream job at a Global Reinsurance company on their two-year Graduate Scheme. Daisy’s new employers noted that it wasn’t just Daisy’s strong academic performance that impressed, and getting a First Class degree is one of her proudest achievements to date, but they were impressed by Daisy’s initiative outside of her academia studies too. Daisy knew from her time here at LSBU that she’d developed key skills and grown as an person, it was her experience during the interview stages that confirmed her thoughts about the fantastic experience she’d had a LSBU. “Fundamentally, my degree at LSBU further enhanced my desirability as a candidate for job roles. LSBU helped me gain the computer skills that employers deem desirable. On completion of my degree, I have strong Excel skills and a certificate for a 70+% result in Advanced Sage Line 50. With that said, Daisy now has plans to get involved with mentoring through a charity which works with young people surrounding their futures, career prospects, and what life might hold for them. What advice would you give to people thinking about studying at LSBU? “The first advice I would like to give you, is that if you choose to embark on your personal academic journey at London South Bank University…be ready to wear your LSBU institutional heritage with pride! I am simply so proud to be an LSBU graduate; most importantly, I am proud to be part of the LSBU family! Studying at LSBU will challenge you, but it will utterly mould you. I had always doubted myself before I started my degree, but LSBU gave me confidence in my ability, improved my skills, and brightened my future. I realised that I comprehensively have a value, and so do you! LSBU helped me maximise on mine.